Those people with artistic tendencies are often said to have found their Muse; meaning that they have discovered their inspiration. The concept of the Muse though comes from Greek mythology, when Muses, as female deities, were recognised. One group of Muses was known as the Elder Muses, or the Boeotian Muses. Writing in the 7th century BC, Mimnermus would write that the Elder Muses were born to Ouranos (sky) and Gaia (earth). Later sources, especially Pausanius and Plutarch in the 2nd century AD, would confirm that there were three Elder Muses, naming them as Aoede, Melete and Mnema. 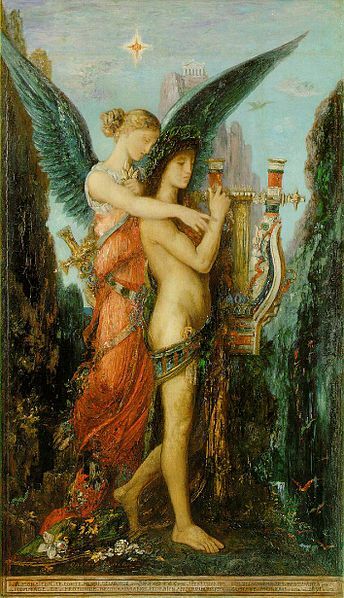 Aoede was the muse of the song, Melete, the muse of practice, and Mnema, the muse of memory. Mnema is also often said to be the Titanide Mnemosyne. An alternative list of Elder Muses, as supplied by Cicero in De Natura Deorum, does name four muses; Aoede, Melete, Arche and Thelxinoe. Arche was the muse of the beginning, and Thelxinoe, was linked with charming the mind. The basic role of the muses was as inspiration for artists, so that they could create, and as guidance, so that the artist could perform to the best of their ability. The concept of the Muses lives on today in poetic form, as artists search for their inspiration. The word muse though can also be seen throughout the English language, with music, amusement and museum all deriving from the original Greek word “mousa”. The English word museum indeed relates to a place where the Muses were worshiped. The Elder Muses were particularly revered in the region of Boeotia, and were closely associated with Mount Helicon in the region. It was on Mount Helicon that there were said to be two fountains, Aganippe and Hippocrene, which were sacred to the Muses. There is a reason why the prefix “Elder” or “Boeotian” is used when referring to these Muses, as within Greek mythology, there were other Muses also recognised. There were the Olympian or Younger Muses, as well as the Appollonides Muses. The Younger Muses, in particular, replaced the Elder Muses in their roles within the arts, and with nine Younger Muses (Calliope, Clio, Erato, Euterpe, Melpomene, Polyhymnia, Terpsichore, Thalia and Urania) named, the Younger Muses seemingly covered all spectrums of the arts. The Appollonides Muses, as daughters of Apollo, were more closely associated with music, and in particular the lyre, where each of the three daughters were thought of as strings of the musical instrument.